Step 1: Cut pattern pieces out. REMEMBER: cut opposite images of pieces when using plush felt. Flip each piece over so you achieve this. Step 2: Pin pattern pieces together with their "mates" - plush side in. 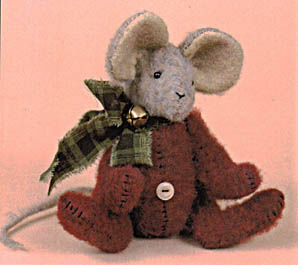 I hand stitched this mouse using pearl floss - sew as you prefer. Leave openings to turn as shown. Stuff. Stitch openings shut. Step 3: Stitch limbs to body, ears to head, head to body. Step 4: Stitch "belly button" in place. Tie bell on ribbon around neck. Stitch eyes on. Step 5: I brushed a little powder blush onto inner ears. Step 6: Cut a 6"-8", 1/4 strip of tan felt, trip one end to a point. Stitch it on to mouse's rump. This mouse could certainly be in his everyday clothes to all tan. By altering the ears somewhat, this pattern also makes a cute bunny. As seen here, fold ear as shown, gather bottom slightly and attach to head.